Company only gathers personal identifiable information ("PII") that is volunteered during the registration process or in response to specific information requests. Examples of PII that may be requested consist of name, address, email address, and telephone number. We do not collect credit card or other payment account information in connection with any purchase you make on or through the Site since payment processing is handled by Paypal. The decision to provide PII is optional on your part; however, if you decide not to register or provide such information, you may not be able to make purchases on or use certain features of the Site or other services on or through the Site. Any information we obtain from you in connection with any mobile service, including SMS services, may include your name, address, mobile phone number, your mobile service provider’s name, and the date, time, and content of your messages. In addition to any fee we may charge, your mobile service provider’s standard messaging rates apply to our confirmation and all subsequent SMS correspondence. All charges are billed by and payable to your mobile service provider. We will not be liable for any delays in the receipt of any SMS messages, as delivery is subject to effective transmission from your network operator. SMS message services are provided on an AS IS basis. You may opt out of mobile services via email to sales@daytradingbias.com or by sending "STOP", "END", "QUIT" to the SMS text message you have received. However, such opting out will not apply to any communications from our other website offerings you have registered for or from the Network Sites to whom we may have already provided your information. If you wish to access, correct, update or request deletion of your personal information, you can do so at any time by contacting us at sales@daytradingbias.com. You will not have to pay a fee to access your personal data (or to exercise any of the other rights). However, we may charge a reasonable fee if your request is clearly unfounded, repetitive or excessive, or we may refuse to comply with your request in these circumstances. In addition, you can object to processing of your personal information, ask us to restrict processing of your personal information or request portability of your personal information to another service provider. 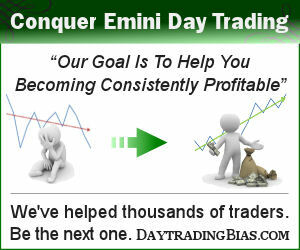 Again, you can exercise these rights by contacting us at sales@daytradingbias.com .